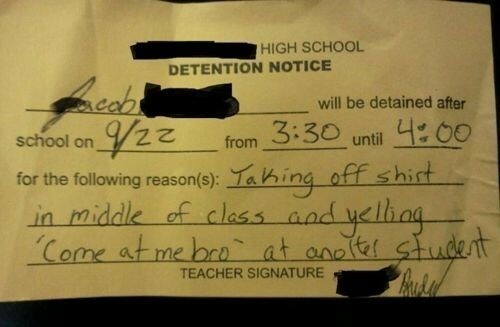 We've seen some funny detention slips in our time, and here's another one for the scrapbook. This slip posted on Reddit is probably definitely the result of a stolen stack of slips, but we can't help but laugh at the idea of it really happening. With all the "Jersey Shore" kids are watching these days, we wouldn't be surprised if this really did occur at least once a month in every public school.